The American Center’s book club invites you to discover a new book with us. This month, we are reading The Boys of Winter: The Untold Story of a Coach, a Dream, and the 1980 U.S. Olympic Hockey Team by Wayne Coffey. They were the 1980 U.S. Olympic hockey team, a blue-collar bunch led by an unconventional coach, and they engineered what Sports Illustrated called the greatest sports moment of the twentieth century. Their “Miracle on Ice” has become a national fairy tale, but the real Cinderella story is even more remarkable. 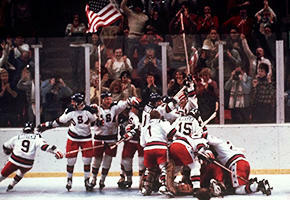 Following the book discussion, we will screen the movie, “Miracle (2004),” which is an adaptation of the book. If you do not have a copy, stop by the American Center to pick up yours today!